Driven Digitally is an Authorised Gsuite Partner and can work with you in setting up your business or helping transform your workplace with using the power of Gsuite. Businesses not yet ready for a cloud-only solution have wanted to manage Chrome OS with the on-premise identity and management systems they’re already using. To help, Chrome Enterprise is now fully compatible with on-premise infrastructure through MicrosoftⓇ Active DirectoryⓇ. This integration allows employees to use their native credentials to authenticate across devices and Google Cloud Services like Google Play while centralizing management of user and device policies for IT admins. We’ve also simplified our on-premise integration trials so admins can sign up and get going quickly in under two minutes with our new simple setup flows. We know IT admins face the challenge of managing a broad range of devices in today’s business landscape. And it’s critical to have the power to manage all devices using a single unified endpoint management solution. 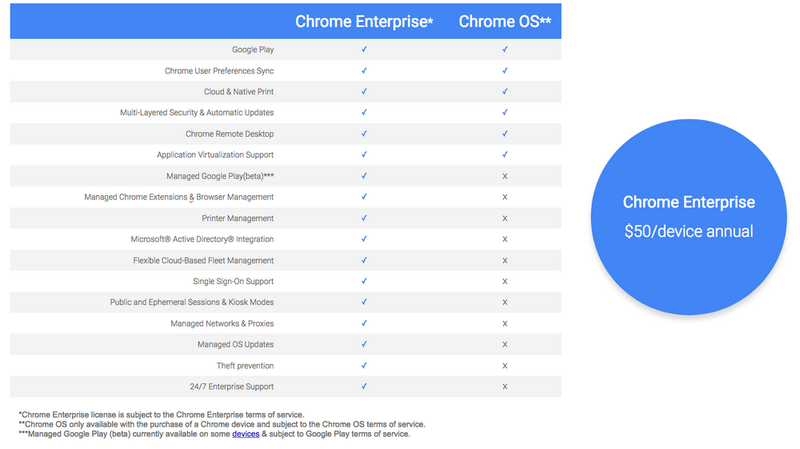 Which is why Chrome Enterprise now gives customers the ability to manage all their Chrome devices from a single management solution. VMware Workspace ONE powered by VMware AirWatch will be the first third party solution provider to manage Chrome devices. Workspace ONE will provide a centralized approach to managing corporate-owned or bring-your-own device. This collaboration combines the speed, simplicity and security of Chrome with the cloud-based unified endpoint management of VMware AirWatch. The compatibility of Chrome Enterprise with VMware Workspace ONE will enable organizations to deliver device policies using customizable assignment of groups based on geography, device platform, department, role, and more – simplifying policy enforcement across the company. Building on previously released integrations of Workspace ONE with Chrome OS, IT admins can also provide employees with access to all enterprise applications – cloud, web, native Android, virtual Windows – from a single app catalog to deliver a consistent experience to employees anywhere, anytime, on any device. Chrome device users can even access full Windows desktops and applications, helping to accelerate the adoption of Chrome devices in the enterprise. Last year, we announced our plans to bring the Play Store to Chromebooks. And we’ve been working to expand its availability to more devices, including enterprise grade options from Lenovo, Acer, Asus, HP, and Samsung. Whether it’s laptops like the Acer 14, HP 13 or Lenovo 13, or mobile devices such as the Samsung Chromebook Pro or Asus Flip, enterprise apps are available to business users on a variety of Chrome devices. See the full list of 25+ devices available here along with those in the beta channel coming soon. According to Ed Higgs, Interim Director of Global Service Delivery for Group IT at Rentokil: “With over 500 Chromebooks in use in our organization, Chrome now forms part of our standard offering within Rentokil Initial. Google's current Chrome OS initiatives will make the operating system of increasing value for us, and we are already finding an increasing number of use cases for Chrome devices. We've benefited from direct support from Google's product and engineering teams, that have worked closely with us to help us execute our goals."